Whatever you can say about the late Drox empire, they sure knew how to make enemies. Not content with turning on their own spy network, the Drox also got under the skin of other races along the way. Older than the known spacefaring species, these Ancients know how to carry a grudge, and have at last returned to destroy the Drox and claim the stars for themselves. Since they’re a little late to that party, they’ll settle for those that bear the name (that would be you). Don’t bother trying to explain that the Operatives fought the Drox aeons ago; that’s just more time for them to lock on and fire. Time to suit up and do what Operatives do best: make their enemies pay, no matter where they hail from. The overall details from Drox Operative still stand; thus, the original score will be reiterated at the end of this review, and should be considered applicable with the expansion content included. As an expansion for Drox Operative, Invasion of the Ancients has made space quite a bit busier. The additions follow in Operative‘s deceptively old-school footsteps, by both adding to existing content in expected ways – new equipment, more quests, a new playable race, more enemies – and creating new elements whole cloth. The resulting upgrade hasn’t much changed the core gameplay mechanics, and this is definitely still Drox Operative, with all that should imply: you’re still flying around making friends, blasting enemies, playing politics, and blinging out your ship. What Invasion does, however, is mix up the big picture; the long game of combat, negotiation, and subterfuge that Operatives are expected to master. Let’s start with the titular Ancients. On paper they’re basically a suite of races that are pretty much always hostile to you, and they’re not much keen on the established races either. The interface sometimes has hiccups – for instance you can trade with individual Ancients briefly before the entire race declares war on you – but in general as soon as they’re aware of your presence, expect trouble. They otherwise behave like any other race: spreading out, claiming territory, climbing the techtree and crushing their enemies. All understandable goals, and but for the simple fact that they can’t be talked down or pacified, one could be forgiven for mistaking them for yet another bunch of weird aliens. We don’t run this place, but we have an understanding with those who do. In practice, it takes the already heavily randomized events in a given galaxy and makes them more dynamic still. You may well come across an Ancient race on the brink of defeat for having made too many enemies, or they might be the first thing you see and it’s on you to rally the other races against them. They could show up right in the middle of an already intense conflict between the known races, squashing anyone too weak to resist. You could spend hours on the other end of the sector, never knowing they’re out there, or they might not even be there this time. As lively as Drox could sometimes be, Invasion takes the idea and runs with it further; the thought that the ground beneath you isn’t as solid as you think it is, and that what you know of galactic politics can change on a dime. The Drox Operatives certainly haven’t been sitting on their hands through this, and one of the other new elements is mandatory guild quests that must be accomplished above any other win conditions; usually with a timer of an hour or two, which isn’t as generous as it sounds. 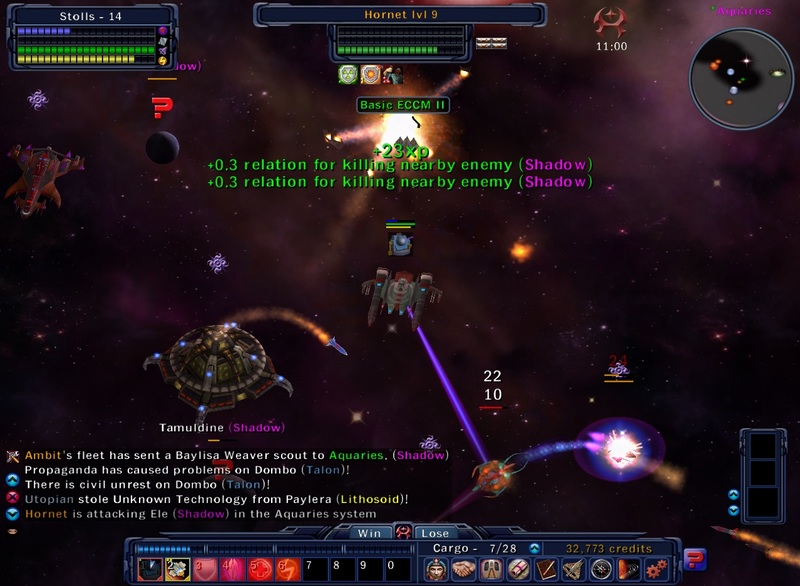 This feature takes the form of an involvement setting that you can determine at the start of a game. Set it to minimal and you may get bothered by home base once every game, if that. Set it high and you may want to refer to “The Prince” before making long-term alliances. Again, it seems like a small change until you think about how complex a given match can be, such that changing even one relationship can change the tenor of the game. This can easily hurl an Operative out of their comfort zone; for instance if they’ve buddied up with the Humans or Cortex or whatever, only for the guild to decide they must lose in this sector. My very first encounter with the system followed a Drakk-Dryad alliance sweeping the sector, forcing me to scramble like mad to sour the relationship when the orders came to snuff out the Drakk. Sometimes the random quests are lenient, requiring simple exploration or the activation of every starlane between systems. They’re usually more involved, however; outright destruction of one race, ensuring another maintains a technological edge, forging a trade agreement between two species, and so on. Since these quests don’t always appear at the start, you could very well find yourself trying to talk down two warring factions, or covertly destabilizing a former ally so they don’t overtly crush you. The effects of these two elements – the Ancients and guild quests – are visible almost out the gate, and oddly enough they sometimes serve as a check on each other. Occasionally an Ancient race will be late to the party, sailing in to complicate a conflict already in progress. However, even the Ancients can’t stand against a strong alliance, and an Operative with powerful friends won’t so much as blink when the hostile comm chatter starts coming in. The Drox quests, as mentioned above, can throw the lever in the other direction, turning that one-sided battle into a careful balancing act; you all may want to thwart the invaders, but you’re going to view the war a bit differently if you need to keep your ‘friends’ from getting too powerful. Like anything with a random number generator attached, it’s not uncommon for these systems to work against you – sometimes before you’ve had a chance to get the ball rolling – but just as often you’ll be given exactly the opportunity you need. The not-quite-as-old dogs have learned a few new tricks as well. Existing races and even NPC mobs can build various types of space stations, from trading posts to defensive batteries to fighter facilities. These installations contribute to a tangible sense of control over a given region, illustrating just who’s on top at the moment. It’s not uncommon to see one parked by a jumpgate or other key access point, and they can make convenient pit stops to dump off excess hardware or quickly tune up your ship. Suffice to say a populated world guarded by one of these can shrug off all but the most determined assaults, and if fate pits you against one, you’ll need all the firepower your ship can carry. Conversely, if you have a horde of angry ships in hot pursuit, there’s nothing quite like luring them into range of your bigger, meaner best friend. Another welcome change is a greater degree of customization for each session. 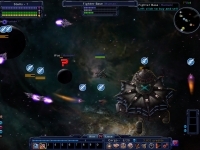 Apart from the aforementioned Drox involvement, players can now dictate the sector’s overall shape – which can greatly affect who runs into who first – and determine whether elements from the previous galaxy carry over into the current one. For instance, if the Dryads and the Hive ended the previous sector in an alliance and with high technological development, players can allow those factors to persist into the next sector; likewise for negatives, from states of war to widespread plagues or piracy issues. This can create a welcome sense of consistency from game to game, as races develop over the long term and the slate isn’t wiped completely clean. New advanced options and challenge sectors offer more ways to spice things up, from starting with a bare-bones ship to being unable to support organic crew members (and the upgradeable stat boosts they provide). The rest of the expansion material fits in easily alongside existing content, such that you wouldn’t know it wasn’t there all along. Equipment sockets provide a way to further tweak your hardware with extra bonuses, and new ship gear – like equipable marines that can board and capture enemy ships – finds niches in combat and then promptly fills them. 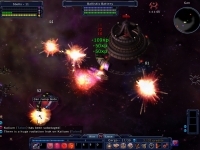 The Scavenger race combines the damage output of Humans with the Hives’ defensive bonuses, while their extra thruster slot makes them good early candidates for get-in, get-out strikes on soft targets. It can take a while before you unlock the truly exotic weapons and subsystems – juggling power drain, equipment slots, and stat limitations in the interim – but there’s a strong incentive to go just a little further; the “morphine drip of progress” as I originally called it. You’ll almost always be just one more level away from something better, be it a humble thruster upgrade, room for a new weapon, or a brand new ship. It’s fair to mention that there isn’t much new in terms of graphics or audio, though that’s no strike against the game; Drox‘s visuals worked fine and they continue to with Invasion. The new races have unique ship designs that are recognizable at a glance, and there’s a nice sense of scale with the size of installations versus your ship, especially in the early game. Dogfights and strafing runs are still visually engaging as you trade missile, laser, and cannon fire, and few things beat the simple pleasure of dropping a mine and watching a cluster of pursuing ships explode spectacularly behind you. 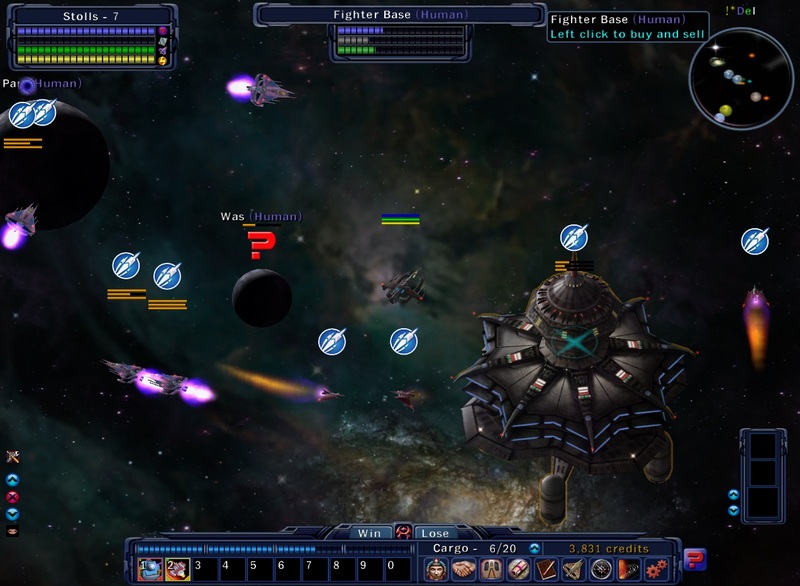 As previously mentioned, the engine handles fairly large space battles quite well; planetary assaults can involve dozens of units spread across multiple races without issue. The space backdrops are pretty without distracting from the action, and there’s attention to detail as well, like planets being illuminated on whichever side faces the sun. Killstealing is just another way of saying you care. With all that said, the random element remains the game’s defining attribute. Like its spiritual relative Din’s Curse, Drox can roll any number of ways for or against you, and sometimes the odds just may be too heavily stacked to come out on top. The race you need to survive may get wiped out before you meet them. Your 9-in-10-chance-of-working bribe might fall on deaf ears. The sector might have double the usual number of mobs, such that any race getting anywhere is unlikely at best. Then the dice land in your favor, and suddenly you’re the kingmaker on a galactic scale, or the one person in the sector that everybody respects/fears. Invasion throws more loops into your best-laid plans, and what separates a skilled Operative from a debris field is often the ability to roll with the punches – to have plans B through Z ready when you need to change who’s shooting at who. Again, this is a strength of the style of gameplay, and Invasion makes it more apparent that the game isn’t waiting for you to make the first move. The other races are playing to win too, and they’re not going to pull their punches, so it’s on you to give it your best shot. And if you lose? Hey, good game, and victory’s only another match away. Take your ship, take what you’ve earned thus far, and start again in the next sector. It’s a credit to the game’s design that it never needs a conventional save system, and indeed would be undermined by it. There is no ideal outcome, no gaming the system; there’s just getting in, taking a stab at it, and being willing to stumble a bit as you learn the ropes. Drox was not a small game to start with, and the sheer amount of base content, let alone unlockable content, can keep completionists busy for a long, long time. In one sense, Invasion of the Ancients is just more Drox Operative, which by itself makes it worth owning but is only half the story. Invasion of the Ancients is Drox Operative playing a little harder, a little smarter, and a lot less predictable; space combat and intrigue with a dash of speed chess. It’s devious, challenging, and easy to sink hours into without realizing it. It’s a friendly rival saying they’ve learned a thing or two since your last showdown, and they’re not going to wait for your grand scheme to come into fruition this time. You need to know how to reverse a bad situation, how to escape from an angry mob, how to get the rest of the galaxy on the same page, and how to bring down a space station solo. It’ll all come up sooner or later, and “sticking to the plan” is how a pilot makes first and last contact with a mine. Thus is the credo of an Operative: no matter who your friends and enemies are, if it needs to happen, make it happen.